Vale of Rheidol Railway01970 625819work Steam RailwayFrom the coast at Aberystwyth, watch the scenery passing by your window. See the countryside change as you travel through wide open fields, ancient woodland and rugged mountain scenery as the line twists and turns, clinging to the hillside to reach Devil's Bridge - home of the famous Mynach Falls and Devil's Punchbowl. Look out for birds of prey such as red kites and buzzards soaring high above the valley floor and listen to the sound of the narrow gauge steam engine working hard on the climb into the hills. Opened in 1902, the railway is a masterpiece of engineering and has been delighting passengers young and old for generations. Although the line no longer carries lead ore from the mines it has been carrying holidaymakers to the beauty spot of Devil's Bridge for over a hundred years! The railway is a registered charity, dedicated to preserving the railway for future generations to enjoy. Our historic coal fired steam locomotives and vintage carriages were built by the Great Western Railway in the 1920s and 30s and are now fully restored. "Wales to the World" - All change at Aberystwyth Station. We are pleased to announce the start of our project to build a new station and multifunction display facility at our Aberystwyth station. The £1.6 million project started in late 2018 and will finish at the end of 2020; see https://www.rheidolrailway.co.uk/project.htm for all the details. The 12 mile journey takes 1 hour in each direction. See timetables for departure times. Passengers may upgrade to the the First Class Observation Saloon for a small charge. Dogs are very welcome on the railway and can travel in all Third Class carriages. A dog rover ticket costs £3.00. The railway can carry bicycles although owing to space limitations on certain popular trains, please contact us in advance so we can reserve space. The railway offers advance bookings through its website, but there is also the option to purchase tickets from the Booking Office on the day of travel. 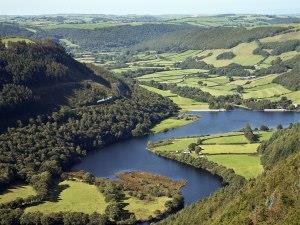 From the coast at Aberystwyth, watch the scenery passing by your window. 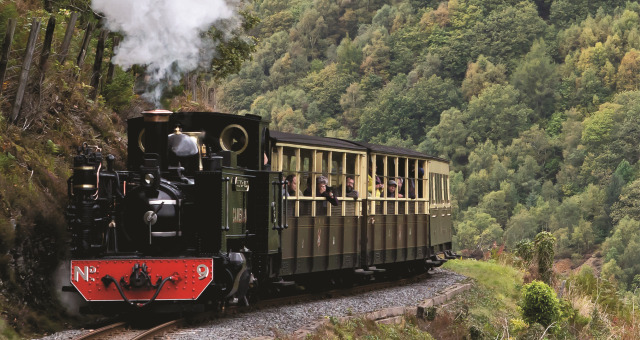 See the countryside change as you travel through wide open fields, ancient woodland and rugged mountain scenery as the line twists and turns, clinging to the hillside to reach Devil's Bridge - home of the famous Mynach Falls and Devil's Punchbowl. Devil's Bridge Station is a short walk from Devil's Bridge Waterfalls - operated as a separate attraction. See website for train times. Please aim to arrive at least 20 minutes before the scheduled departure time in order to purchase tickets and board the train. Return Fares with Gift Aid: Adult £25.30, Child (3 - 15) £11.00, Family (1 + 2), £40.70 Family (2 + 2) £60.50. Children aged 2 years old and under travel FREE. For non-gift aid, prices are £22.00, £20.00, £10.00, £37.00 & £55.00 respectively. Dogs are welcome. The dog rover fare is £3 per hound. Bicycles can be conveyed for £5 subject to space being available. If you plan to bring a bicycle, it is advisable to telephone beforehand. By Public Transport: The Vale of Rheidol Railway is located in the centre of Aberystwyth and is a short walk from the mainline railway and bus stations. By Road: The Railway has a large car park off Park Avenue/Boulevard St Brieuc near the Park & Ride site and the SAT NAV Postcode is SY23 1PG. Trains The railway operates a fleet of historic railway carriages which were built for the line between 1923 and 1938. To access the carriages, there are two steps of 400mm between the platform and the carriage floor. Extra steps are available if required. The carriage doors are 580mm wide and internal gangways are 420mm and 520mm wide. We regret that these vintage carriages are not suitable for customers who need to remain in their wheelchairs.